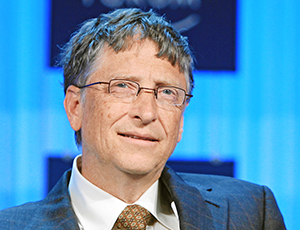 In the same post, Gates also praised the forthcoming Factfulness: Ten Reasons We're Wrong About The World--And Why Things Are Better Than You Think by Hans Rosling, which he promised to write more about later. In December, Gates blogged about the reading he did in 2017, including his five favorite books of the year. He praised Evicted by Matthew Desmond, which we named to our list of the 10 best books of 2016 (and which recently inspired the mayor of Milwaukee to propose a visionary 10-year housing plan), as well as one of our favorite works of fiction of 2015, The Sympathizer by Viet Thanh Nguyen. He also included an acclaimed graphic memoir, The Best We Could Do by Thi Bui; a "masterpiece" about energy, Energy and Civilization by Vaclav Smil and, surprisingly, Eddie Izzard's memoir, Believe Me. He recommends more titles in his post about his five favorite books of the year. He also posted earlier in 2017 about his favorite summer reading choices.